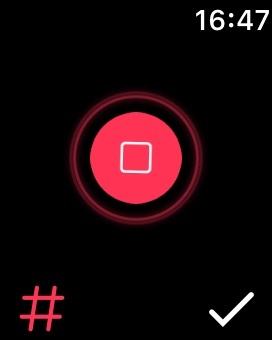 On your Apple Watch, tap the red button to start recording. 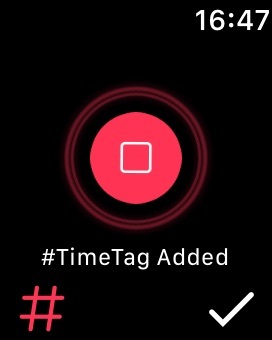 Tap the ‘hashtag’ icon to add a #timetag. Remember to tap the ‘tick’ button to save once finished recording. Then, it will sync automatically to the paired iPhone. On your Apple Watch, tap the moving red button to pause and or continue. Once done remember to tap the ‘tick’ button to save the changes. Once saved, the new recording will appear on top of the recording list on your Apple Watch and iPhone.